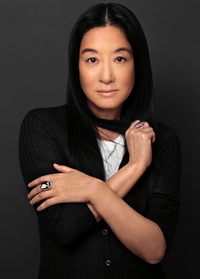 Fashion Notebook: Lesssons In Branding: Is Vera Wang the Next Martha Stewart? Vera Wang, a high-end designer who has made a name for herself over the past two decades creating wedding gowns (with price tags to match, and photo'ed, right), is now opening her own wedding registry—a first in the designer market. Which kind of surprises us, and then, eh, not so much, and then we're all like: "Hey why did no one think of this before?!" Anyhow... back to the relevance. VeraWangonWeddings.com will allow not only custom registries for engaged couples, but also a breakdown of runway trends, e-commerce, couples quizzes and wedding planning ideas from Wang herself. But the bridal registry and e-commerce site is only the tip of the branding iceberg for Wang. In a series of moves similar to those of the one-woman empire orchestrated by love-her-or-hate-her-you-betta- respect-her Martha Stewart, the designer has recently expanded into diverse categories such as bedding, home goods and stationary. Additionally, Wang launched a collection for Kohl's stores late last year. "Our authoritative position in bridal and bridal registry has allowed us to leverage this [consumer] trust into a lifestyle brand," said Wang. "The next logical step is to capitalize on our relationship with the client over the course of their lives. Our objective is to continue to grow our lifestyle product offering and keep pace with the evolving needs of the consumer." Wang added that, moving forward, her company is exploring expansion into furniture, decorative fabrics, rugs, lighting and even a Wang-branded line of paint. Now we just won't know who's jungle green to trust when we repaint the bathroom: Vera's or Ralph's? But what's to stop Wang from becoming like others who burst into multi-category expansions like Bill Blass or Halston, and getting less than sterling results? (Take "less than sterling" to mean abominable here, dears.) Well, apparently, it's because, as Dylan used to croon in that nails-on-a-chalkboard voice: The times they are a-changin'. And so are consumers and designers, y'all! "We're at a different time for both consumers and designers; and I think Vera is really capitalizing on the ability to do both high and low in the design realm," said Wendy Liebman, CEO of WSL Retail, New York. "The level of sophistication and level of exposure of shoppers has changed and that acceptance, through what's gone on with H&M's designer collaborations, has really opened a door." For Liebman, Wang's strategy makes sense and she doesn't seem to be stretching the bounds of her brand potential. "The expansion into bridal registry is a logical one, and the home goods are the same . . . Certainly her work with Kohl's appears to be working," said Liebman. "When you look at what Bill Blass or Halston did, versus what Martha or Vera are doing now, you've got a convergence of a smarter shopper and a smarter designer." Yes, yes, all well and good. And we think V might actually pull it off. But if her marketing folks are reading this, please, please let us make one wish for how she rolls out home goods, particularly kitchen appliances. 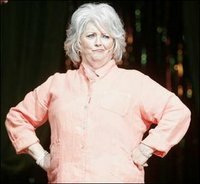 Forget the Today Show and get Ms. Wang's face on Food Network's "Paula's Party." We're salivating at the proposition of having Paul Deen (photo, left) do a wedding cake episode with Wang brought on as creative consultant, and having Deen shout out: "We're making weddings today, y'all, and I've brought along my good friend, hot cutter, I'm sorry, I'm sorry, howit creature... Oh whatever y'all, it's fashion designer Vera Wang!" The episode practically writes itself. This is a sure-fire way to sell Wang, and her image, unequivocally to the lucrative Middle America and mass markets. I actually think she's got what it takes. She's branching out from wedding dressing and professional clothing to home accents etc - I think there's room in the home market for them both.